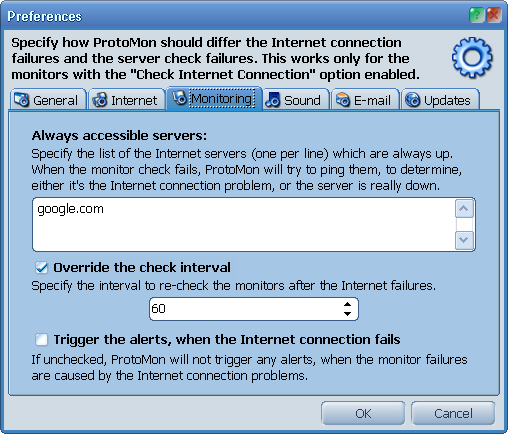 ProtoMon is able to distinguish between the Internet connection failures and the servers check failures. Each monitor has the Check Internet Connection option. When this option is enabled and the server monitoring check fails, the software will ping the specified Internet servers to determine whether Internet is available, or not. This allows ProtoMon to keep separate statistics for the server downtimes and Internet problems. By default, the Internet connection problems are not considered as monitoring failures. If you wish ProtoMon to send the notifications in that case, check the Trigger the alerts, when the Internet connection fails option. If Always available servers are not specified, ProtoMon will assume that the Internet is always available. Additionally, you may wish to re-check monitors more frequently, when connection is absent. This will help ProtoMon to quickly learn, that connection is back, and start writing the real statistics. To do so, set the Override the check interval option and specify the desired interval.